Professor/Professor/Assistant Professor jobs you can apply Online. They Preferable IIT’s, NITs and reputed Universities. 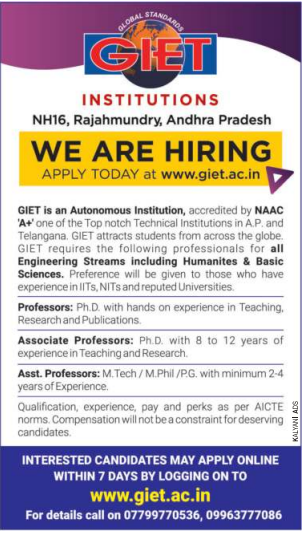 Eligible candidates can apply online with in 7 days from the notification date for GIET Associate Professor/Professor/Assistant Professor posts. 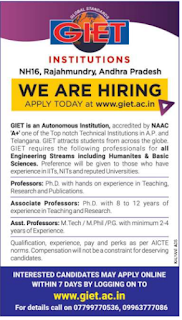 Further Details can refer the official website www.giet.ac.in. Required details like Salary, Important Dates, Available Vacancies, Qualification e.t.c are given below. Godavari Institute of Engineering & Technology (GIET). Ending Date to apply Associate Professor/Professor/Assistant Professor Jobs : with in 7 days from the notification date. Associate Professor: Ph.D with 8 to 12 Years of experience in teaching and Research. Assistant Professor: M.Tech/M.Phil/P.G with 2 to 4 years Experience. Eligible Applicants can apply online with in 7 days from the notification date.